When we point to the economic math as proof that the system is doomed, and then claim foul when ‘they’ manipulate the math (for example with understated inflation and unemployment rates or overstated GDP, corporate profits, total employment, growth etc.) all the hidden hands are really engaging in is massive (global) perception management among the mostly mindless minions. They are giving the unquestioning, but willing, a reason to continue to believe and a place to endow their faith. But even more important the high priests must preach to the choir for this is where the (new and improved) dogma and doctrine is directly passed on, reinforced and deeply embedded. Perception management must occur among the million or more (U.S. and global) financial professionals who act as local and regional ‘economechanical’ priests and centers of influence (read faith and belief leaders) of the artificial economic reality being created and manipulated in ‘real’ time by the elite. As long as the music still plays on (and by constantly and incrementally changing the tune the music can play for much longer than we think) even if the professional financial priest harbors great doubt about the viability of the system or the ethics of what he (or she) does, he must continue to dance or be left off the dance floor and out of this very financially rewarding (religious) profession. As long as the professional priests continue to dance and lend their perceived credibility and influence to those who might be best characterized as laymen, thus buttressing the layman’s faith and belief, the system can and will limp along for quite a long time. Not only must the lower level financial professionals buy in and be in sync with the dogma of the promoted financial reality, so too must the upper level of the economechanical hierarchy. Faith and belief in nonsensical ‘truths’ is difficult to maintain in isolation, especially when it contradicts our inner knowing and common sense. The upper echelons (other than the true psychopaths) are not immune to cognitive dissonance and will waver if not steadied and externally supported. Those who are not reinforced from time to time tend to stray a bit and begin to lose faith, particularly when there are locals with pitchforks and torches outside the main gate. Thus we see the real reason behind high level financial and political conferences such as the recent gathering of the top tier faithful at Davos, Switzerland. Each level of the hierarchy must regularly gather in order to resynchronize with the ever changing alternative reality frequency, which in turn helps to harden the newly created psychological cement that binds together the money meme. This is vital if the farce is to be over powering and able to withstand dissent and disbelief. This is also the real reason behind the Federal Reserve Board meetings every six to seven weeks. The high priests must gather to conduct cult policy review and hand out holy dispensations and divine guidance to the lower levels of the cult hierarchy while simultaneously engaging in ritual practices to strengthen the money meme, first within the gathered select attendees and then filtered down to the brain washed cult followers and sycophants. Fed speak is at least equivalent to, if not exceeding, Pope speak and anyone who cannot see this is either in denial or just in too deep. If we wish to believe that two plus two equals five or that the answer to life, universe and everything is forty two, then math is no longer a constraining factor upon the present economic system. But the socioeconomic system relies on mathematics to support our faith and belief in the system primarily because we have near complete faith and belief in mathematics and the sciences. In chapter two I questioned the wide degree of wiggle room we afford the sciences, the constant backtracking, correcting and amending that occurs in the so called ‘precise’ sciences, including physics and economics. But one can see that this wiggle room, these allowed wide tolerances in what is consistently promoted as exact and precise, is actually regularly exploited by the cult leaders to maintain authority while handing down new and ever more fantastical decries and mandates. We observe the same thing in organized religion and various other ‘consumer’ cults. The word of (God, Fashion, Entertainment, Consumer products, fill in the blank) is THIS and must be followed to the letter…….except when it is this, this, that or those over there. Wait, is it Fed Tuesday? Then forget all that, because this right here is now the word of “Ben the Bearded Beneficent”. Special thanks to WilliamBanzai7 for this image. In effect when the ‘authorities’ lie and manipulate they are distorting our perceived reality and relying on the fact that our desire to maintain our status quo within the system through our support of the system (the compromised ‘we’ I discussed in Chapter One) will be greater than our desire to know the ‘truth’ of the situation, which all of us know will undermine our faith and belief and the system with it. So help me God we really don’t want to know the truth, the whole truth and nothing but the truth. Jean-Claude Juncker said as much when he stated that when things get serious you have to lie. The authority must lie because most people do not want to hear the truth precisely because that particular truth will undermine the BIG LIE. The official lie in question is actually just one lie within hundreds of deeper lies, all supporting each other like a house of cards. If the authority were to admit the truth, especially when faith and belief is at its weakest, then those who are psychologically dependent upon the entire house of lies would be forced to question everything if this truth were exposed. A crisis of faith is what would result, and the high priests (in this case Juncker) don’t want that to happen when blind unquestioning faith among the dependent believers is all that is holding the economic wreck together. Based upon my casual discussions with average people everywhere I eat, shop and play, while the details may not be known, most people really do know that things are worse than we are being told. But to truly ‘know’ it, meaning to have it confirmed by an external authority, makes it real and undeniable and something we must now face. There will be no more wiggle room left for us to exploit; the warm dark place denial grows and prospers in. If we live by the affirmation of the external authority, then we die by the affirmation of the external authority. As long as they continue to tell us things are OK we’re gonna believe them…..even if we really don’t. The official lie is most effective when we want to believe the lie more than we wish to know the truth simply because the compromised person is supplying the unquestioning belief with no demand of the liar for ‘proof’ or confirmation. “Daddy, tell me another lie so that I may believe it is the truth.” For example, when there is suspicion but an unwillingness to believe the suspicion (aka denial), how many people really want their spouse to tell them the truth about their infidelity? I’ll bet ten bucks nearly every reader’s ego just reflexively said “I would want the truth”. Under those circumstances (suspicion and denial) not only will many want their spouse to lie, but they will want their spouse to lie well enough that they have less trouble believing the lie to be the truth. In order to do this we will deny our denial by telling ourselves and our spouse that we really do want the truth, while ‘secretly’ hoping to be lied too IF there really is infidelity involved. When deeply conflicted and compromised we ask questions in such a way as to telegraph our desired answer, for example “Tell me you’re not cheating on me honey.” Who has not felt great relief to hear what we wanted to hear (“No honey, I am NOT cheating on you.”) even when nagging doubt and suspicion lingered? How many times have we avoided asking our children the really tough questions when we harbored strong suspicions we weren’t getting the whole truth? Or that we ignored some glaring inconsistencies or a flat out lie in order not to know the truth we suspected might be lurking. Or sometimes we just want to avoid the hassle and confrontation, a convenient excuse, so we go along with it and not challenge the lie. If we do this often and long enough, soon we begin to believe the lie because it has never been directly refuted. In effect the lie is being indirectly supported by not being challenged by the person being lied to, making us in many ways complicit. The ultimate effect is that the lie begins to take on a ‘truth’ life of its own. When this happens, truth becomes whatever we want it to be because it is constructed almost entirely of lies with just enough truth mixed in to give it some street cred in our minds. No ugly shapes or sharp edges to deal with this way. But deep down inside we know we are living a lie and it eats at us from within, creating a deep neurosis and a thoroughly compromised being. Once we ignore the lie psychologically we become enablers of the lie. Every time we ignore the lie we are deepening our involvement and our own culpability. Soon enough we find ourselves defending the lie in order to defend ourselves. To out the lie and the liar at a later date means outing our prior complicity, even if only to ourselves. This is why we find so many people believing the official lie(s) and actively supporting that which is contrary to their best interest or basic beliefs. The greater the distance between the person and the effects of the (official) lie (i.e. death by Drone of brown people in Pakistan) the easier it is to maintain the lie. Vice versa, when close proximity to the effects of the lie threatens exposure to or even direct (emotional, psychological or physical) harm to us (i.e. death by Drone of American citizens in America) we tend to ramp up our righteous indignation to psychologically cover our complicity. Maybe it’s just best to just leave sleeping dogs lie (sic). We do exactly the same thing with all aspects of the government, military, judicial system, corporations and of course the financial system. Please don’t tell me because I just don’t want to know. And to make sure I don’t know what I don’t want to know……I won’t ask. Earlier I stated that willing participation can be defined as just about any participation, regardless of whether it’s agnostic, mindless, suspect, hostile, even forced or compelled. One’s faith and belief in the socioeconomic system doesn’t need to be total and unwavering (though that would be ideal) nor even in agreement, just that there be no other viable competing meme to divert or distract the participants’ focus and energy. This helps explain the tremendous amount of energy expended by the fiat magicians to demean, deny and manipulate the meme competing precious metals. When you cut through all the smoke screens, deliberate distractions and ritual practices this is a truism for any cult, not just the money meme. In order to maintain its supremacy, a cult and its leaders cannot tolerate significant internal dissent or disbelief (or external for that matter, though it isn’t quite as critical) because its primary energy source is belief. Even if we don’t agree with the process, even if we feel compelled to do as we are told, as long as we exchange our labor, goods and services for script, then exchange that script for other labor, goods or services, we are willingly participating. It doesn’t matter if we are locked into the money meme by law, which in turn is enforced with an implied state threat of violence if we do not obey. Each time we accept currency in exchange for our labor, we want to believe that it will maintain the ‘value’ we just embedded in it with our labor so that we can exchange the script for whatever it is that we wish to purchase at ‘fair value’. The fact that it does maintain the vast majority of its value for the relatively short period of time it takes us to engage in most of our transactions just serves to reinforce our belief in the currency. The proof of our (mostly unquestioning) belief is that we give this concept little to no thought while we are engaged in our various purchases. We open our wallet or purse and pull out some currency or a credit/debit card and we pay. While we may complain about the price, on a day to day basis most of us don’t see the rising price(s) for what it really represents, the diminished value of our currency, but rather just the need for more ‘money’ for that week’s groceries because prices always go up. Even those of us who understand what’s really going on don’t automatically think currency devaluation when we stop at the gas pumps. We just think in terms of the need for more money because gas is up again. This just serves to prove how much faith and belief we really do have in a currency we say we don’t believe in. You believe that for now, with ‘now’ measured in years, months, weeks, days or just hours, that whatever fiat chit you are handed can and will be used to pay your bills, purchase your precious metals and do whatever else you desire. Belief does not have to be total and unquestioning in order to be effective and energizing. The system feeds off of this mental and emotional flow, and not necessarily in any static stock of belief. As Zero Hedge’s Tyler Durden likes to say, it’s not the stock but the flow. The same concept of ‘willingness' applies to the US Federal income tax system. It is promoted as ‘voluntary’ by those who control and benefit from it because we voluntarily file our own tax return with ‘volunteered’ information. Our tax declaration (aka our tax return) is not prepared for us by a central authority (because that would be involuntary) but by us and us alone, thus the reasoning behind this twisted logic. Most importantly, we declare our voluntary participation in the money meme to be true or ‘real’ when we sign the tax form (“….and to the best of my knowledge and belief, they are true, correct, and complete.”) thus closing the mind control loop with our affirmation of the true or ‘real’ nature of the artificial reality. We then document or seal this consent with our symbol of willing participation, our signature. This is an extremely powerful form of mind control magic in every sense of the word. This concept can be applied to all (financial) contracts we negotiate and enter into. In the eyes of the ‘law’ (another powerful mind control meme I won’t even begin to discuss here) and with the benefit of centuries of social conditioning, as well as the proclaimed foundational basis for the capitalistic economic system we supposedly live within, we are all free to engage in commerce and to sell our labor to the highest bidder. The presumption is always that you are a willing and engaged participant and that any transaction you undertake is done without coercion or duress despite the obvious nature of your coercion and duress. In fact, even when we know that we ‘have no choice’ (aka under duress) we still (must) apply our symbol of acceptance and agreement, our signature, to the document saying that we do so willingly, freely and of sound mind and body. Without understanding (or believing) the subtleties of exactly how subliminal mind control works, it is extremely difficult to understand how powerful this force is. Our total subjugation is never more apparent as when we see polling that indicates that a tremendous percentage of the population believes that regardless of whether there might have been fraud involved in the mortgage process, since they signed the loan documents to purchase their home they are personally bound to honor the loan. This in spite of the clear and obvious fact that the other party to the fraudulent transaction did not feel honor bound either to (any of) their agreements or to the (spirit of the) law underpinning their agreements, thus invalidating the loan contract based upon common sense and moral grounds if nothing else. Sadly the average person still wishes to believe that the courts and the legal system are there to protect them (the prey) from the predators, when in fact it is explicitly designed to protect the predators from the prey. Only the thoroughly captured psyche of the mind controlled and conditioned (wage) slave exhibits such a distorted and misplaced sense of honor and subservience to their abusive owner/master. The controller/master will always stack the socioeconomic deck in his or her favor as long as willing wage slaves keep lining up to play. Sadly the system stacking goes so much deeper than just the deck. I am not being judgmental here, just calling it as I see it. It is obvious that I’m cooking in the same mind subliminal control pot as everyone else and I struggle to find ways to protect myself and my family, often from me and my own life long conditioning. If I am to have any hope of success then I must understand both my mind and that of the predator, thus the reason for my constant self examination and for posting my occasional musings here on Zero Hedge. Unfortunately nearly everyone rejects the notion that they are under the influence of any type or form of mind control (well………they might be influenced, but certainly not me) despite enormous and glaring examples everywhere we turn. Advertising is a huge example of continuous overt and covert manipulative mind control and conditioning techniques employed to the nth degree. Because a more aware and deeper understanding of our everyday exposure to advertising totally contradicts our own deeply held (manufactured and conditioned) image of a self directed life, our ego goes to great lengths to shield us from this emotionally disturbing information. When shielded by our ego, when protected from ourselves by our ‘self’, we tend to mostly ignore any information contrary to our deep seated belief systems or we prefer to believe that we are forced into participating, that we have no choice in the matter. Victimhood is always and forever a perfectly blameless occupation. Or better yet, at least from the mind control perspective, we (want to) believe we have freedom of choice and that we willingly choose mind control and slavery. Though our ego would rather have us think of it in terms of modern day prosperity and opportunity via a college education and a career ladder. Every right thinking individual wants a well appointed hamster cage with exercise wheel and flat screen TV. This is where the leverage of the mind control comes from and where it is applied; by skillfully using our self induced blindness of what is quite obvious to any disinterested and unaffected observer against us. The art of mind control is not just to compel you to do something you would not ordinarily do if of sound mind and body, but to instill in you the belief that the idea originated within, and that it is what you truly desire. This sub conscious high jacking simply cannot be accomplished for long if we always keep a central self awareness in the front of our mind. I was the problem, I am the problem and I will always be the problem for as long as I do not see the problem. And the problem is that I am the problem. This is not an exercise in self abuse as some (egos) might claim, but rather an exercise in humility and self understanding. The problem, and thus the solution springs from within. If we understand how ‘willing’ doesn’t mean ‘in agreement’ then it really doesn’t matter if our Federal income tax participation is compelled in dozens of different ways, including involuntary tax withholding and mandatory reporting of our financial information from various financial sources. From the mind control perspective certain acts must appear to be voluntary in order for the (money meme) mind control to effectively work. I understand that this explanation of our ‘willing’ involvement will irk many who read this and rightfully so. It is never easy to face yourself naked in the mirror for the first, second or third time. But in a closed loop socioeconomic system there is nowhere to run and nowhere to hide. This fact just makes it that much more important that we be brutally honest with ourselves and that we proactively practice personal sovereignty beginning with eliminating our comforting and disabling self deceptions. If the economic math doesn’t fit the reality then slowly change the mathematical equations in order to create additional plausibility. This effectively extends and fortifies the severely weakened economic reality, essentially providing additional or renewed reasons to continue to believe. If nothing else this buys the system controllers more time which is then used by those who abuse and control to loot, pillage and batten down the hatches while further turning the screws of oppression on the willing wage slaves. As I have said before we really do want to believe, even those who claim they want the entire stinking mess to collapse. They see no alternative to the current state of affairs, so they champion scrapping the present system only because they wish to create a new, more fair and equitable (money meme) system upon which they can once again ‘willingly’ bestow their full faith and belief. The far more common apathetic response is actually still willing participation without exhibiting explicit agreement or resistance to the unacknowledged symbiotic bargain. An emotional escape route (apathy) is preloaded to relieve the pent up frustration and anger that comes from being (self) trapped with nowhere to hide. Long term caged wild (human) animals often demonstrate this behavior, a sign of deep neurosis and emotional paralysis. They still wish to believe, but are unwilling to invest the emotional energy to actually believe for fear of once again being bitterly disappointed. In the case of the more thoroughly captured minds, the thought of living without the present day money meme is so disorientating and frightening that they will plead with their abusers to do whatever it takes to continue the existing system. From the perspective of the mind control meme there really is no other way to describe all these mindsets other than ‘willing’ regardless of whether it is coerced, manipulated, passive or desperately offered. As simplistic as the above descriptions might sound they pass the smell test quite well. The mind control method of slow incremental changes to our perceived reality has actually been used repeatedly for hundreds (thousands) of years. The rules, particularly the unwritten ones, have been repeatedly changed and the outer boundaries continuously pushed further and further back. And yet even though the system appears to be ever more unstable, the music plays on and the puppets continue to dance. This in turn leads the clueless and asleep, as well as the doubting Thomases among the financial professionals, to think that things must be somewhat OK since the entire global economic contraption manages to creak along. It certainly helps to assuage the growing fear within the professional financial community that maybe she might just blow. When the international Gold standard was found to be too constrictive, ‘they’ changed the rules and parameters of the then present day paradigm and created a new reality of ‘safe’ un-backed leveraged fiat (the petrodollar was the eagerly accepted cover story) simply by gaining an overwhelming buy in first from the international high priests, then by the lower level local/regional faith and belief leaders (the financial professionals) who in turn induced the acceptance of the changed conditions within the true power base, the compliant and complicit public. Any new economic reality can be created as long as there is sufficient buy in by those who manage the active ingredient, our faith and belief. That means you and me folks. Ultimately this is a top down process, leaving the actual reality creation in the control of the elite essentially by default since we long ago abdicated our responsibility to do so. I would suggest that within the present day madness any socioeconomic construct is doomed to fail from the moment it is birthed simply because it is almost always based upon some type of widely believed mathematical parameters that have strongly perceived inviolable boundaries. These are initially set in stone to instill faith and belief in the new economic system, and are designed to engender confidence in a new non-real reality. Often this was done because the ‘new’ currency/economic system is replacing one which just failed to retain widespread faith and belief and thus was abandoned by the population, usually because it was used and abused by the elite minority to enslave and control and loot the majority to the point of utter disbelief. While a quick Internet search will disclose certain ideal traits that many claim are needed to create a fully functioning and long lived currency, and by extension a (re)new(ed) economic system, in fact the only critical characteristic needed is confidence in the currency, essentially faith and belief that it will serve the needs of the participants with a minimum of risk and a maximum of utility. Or at least that the pain inflicted upon the population by those who control the system is perceived to be tolerable in exchange for certain valuable considerations. Ideally, with the proper amount of externally applied propaganda and conditioning (cough, cough….mind control….cough) we might even be convinced to believe that the pain is desirable, such as the fiction that inflation (legal institutionalized theft if you really want to properly describe it) is good for you and me. I’m not saying that the old economechanical rules can be repeatedly violated with impunity or that there will be no blowback. Not in the least. But we are all affected by our continuity and normalcy bias (aka egoic denial techniques) which in turn help to reinforce the present day false paradigm. Taken as a whole, this counteracts some of our fading faith and belief, allowing the socioeconomic system to perpetuate far beyond the point of no return. 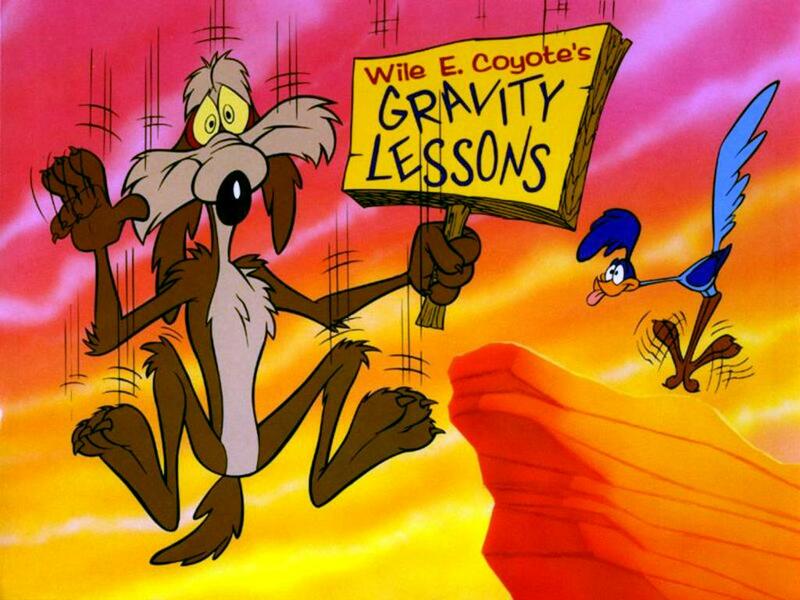 Remember that Wile E Coyote does not actually fall once he has ventured past the cliff edge until he looks down and recognizes, then emotionally accepts, that there is no more support underneath. It is only when he emotionally internalizes his certain fate by way of a ‘help’ sign or just his pitiful knowing eyes that he actually begins to fall. Since we really don’t want to look anyway, any plausible excuse (and a few that defy the imagination) will do in a cognitive pinch because it is not the actual hearing or seeing of the lie that is so comforting, but the emotional relief we feel when we are offered the lie that will not force us to contradict what we want to believe is the truth. We all do this folks. The only questions are how often and how well do we hide it from ourselves. As much as we, the contrary observers, wish for it to be otherwise, for now at least we are a very small (but growing) minority. And within the present day consensus reality where faith and belief are the reality creators, or at the very least the reality enablers and the active force behind and the bedrock support of the current socioeconomic paradigm, to ignore or to down play the power of this phenomenon is to ignore the true reason why the present economic system has managed to last this long, and may last even longer than we can possibly imagine. I wish to emphasize that this is not to say that the system isn’t degrading rapidly, even exponentially. Nor that there will not be sudden and widespread economic dislocations or even outright failures (read that as stock market panics and runs on the banks) as the rot progresses and subsystems become ever more fragile. But contrary to perceived common sense even these obvious public signs of pending system failure will not initially be fully believed and accepted as truly threatening by the general population (because unlike the impossibility of being a little bit pregnant, one can be a little bit in denial) and will most likely be more or less denied precisely because they are so detrimental to all. There is no doubt that there will be more and more people trying to run for the exits as their faith and belief wane. But once they realize that the exit doors are too small or too crowded for them to get out (or worse that the exit just leads them directly back into the burning building) a great hue and cry will rise from the flames demanding that those who are destroying the system better damn well fix the system. Once again the prey will demand that the predators be put in charge of leading the prey to (another) slaughter. When our world view is directly threatened, most of us will reject that which contradicts our beliefs or threatens our perceived livelihood and economic safety. The more threatened we feel and/or the closer we believe the danger to be, the greater the tendency there is to remain in denial or even to vigorously support that which we are dependent upon. Those who don’t wish to see (and the worse it gets the more who will fit this description) the more they will seek the comforting lie and the emotional crutches authored by public authorities. Child like, many will ask for the lie (and the scapegoat) so that we may self deceive. Because society’s tremendous momentum of prior belief and willingness to be lied to will be combined with deliberate fear mongering and outright official denial (and don’t forget the all important scapegoating) even when the system reaches critical failure points, the entire financial structure will most likely not collapse in one fell swoop. Instead what will likely happen is that large and small pieces will break loose and fall off, only to be quickly hammered back into place in whatever sloppy way they can manage. If the emergency carpentry fails to ‘fix’ the problem, and it will not, then the failures will be replaced with even more fantastical economic creations and financial manipulations that defy wavering believers to look too close for fear of glimpsing the ugly truth. This includes political and economic machinations that would boggle the mind if presented today, but will most likely be welcomed with open arms when the frightened truly become desperate and panicked. Like a person navigating a descending set of irregular, uneven and crooked steps, the financial system will probably bumble and stumble on down into oblivion, with each step possessing a different drop and duration, some very large and some small. There will even be occasional rises and short lived landings before the next section of the barn begins to crumble. It is impossible to say exactly how this will all work out simply because the world’s elites have never been to this point before and neither have we. But we would be fools to think that such a complex living organism with so many moving parts and such emotional energy (I would argue that denial is the strongest emotion, surpassing love and hate by a country mile) will act like a complex mechanical machine and simply stop one day, though parts of it most certainly will. In my opinion it is the absolute conviction of our basic belief systems that is keeping the system supported and in place, at least for the moment. I’m not just talking about the socioeconomic system, but our unquestioning and absolute faith and belief in the larger generally prevailing worldview of how things work. This includes our fundamental belief in math, science, technology, religion, matter, energy and so on. I’ll cover this in greater detail in a future article, but our worldview spans so much more than just a belief in the surface functionality and utility. It is not the Federal Reserve or the banksters or the various dependent-upon-unlimited-fiat-creation governments that are supporting the present day socioeconomic system. I would argue that the ultimate strength of any complex economic organism is the faith and belief the dependent participants have in that very same system. That faith comes from you and me and the guy down the street, not from the Fed, the government nor the banksters. They do not create our faith and belief, but rather they are the recipients, manipulators and abusers of our faith and belief. So when we measure the fragility of any socioeconomic system we must actually measure the strength of those who support it, particularly their faith and belief. After several generations of rote education and reflexive conditioning combined with an ever increasing dependence upon the very system we now claim will collapse quickly and completely, may I suggest that our faith and belief, and ultimately the false hope that it engenders, will die a long, hard and very painful death. Thus any economic system supported by our captured minds will also die a long, hard and painful death. While I will not argue with the belief that the dozens upon dozens of economic and cultural death spasms will be sudden, violent and most certainly unpredictable, the faithfully desperate believers, facing the black abyss of self sufficiency and self reliance after dozens and dozens of years of dependency conditioning, will beg to be saved from themselves, thus supporting a doomed system long past its perceived expiration date. False hope chains us to our own self delusions. This truism cannot be over stated. At one time or another we have all clung to impossible situations way too long for our own good when we were emotionally dependent, regardless of the ‘facts’ of the situation. ‘We the herd’ will undoubtedly do so as well.